With generating and preserving wealth, it is also equally important to de-risk our life from unforeseen uncertainties (to the extent possible). These uncertainties have the potential to derail our financial life, totally or partially depending on the gravity of the event. These risks can be done away with by ensuring our-self. Insurance is a means of protection against financial loss. It may not be exactly possible to replace the loss of an asset but insurance provides financial support to replace the lost asset. 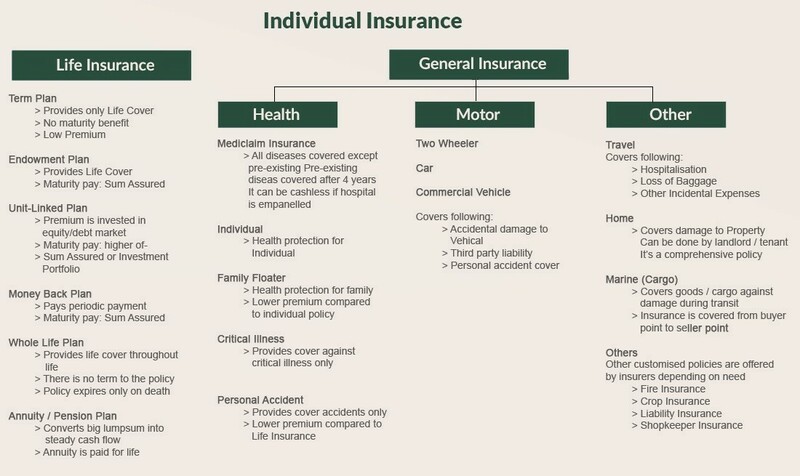 What is Insurance - the company (insurer) provides insurance to the insured (policyholder) to compensate in the event of occurrence of loss, in exchange for payment of a small amount, by insured, called premium. The premium payment is usually annual, however, the frequency may change depending on the terms of the policy. Let’s take Life Insurance first. Risk of living too long. The above two risks are very critical in life and needs to be consciously addressed by every individual. Whilst the first risk can be covered through Insurance contract, the second can be insured through proper investments throughout our life. If you are a key earning member in the family and the family is solely dependent on you for their livelihood then it becomes all the more important to insure your life. We suggest life insurance cover which is approximately 12-15 times of your annual income. The underlying logic behind this multiple is that in case of loss of life, the amount received by your family from insurance company can be parked in fixed deposits which can fetch interest almost equivalent to your present monthly income. While loss of your life is irreplaceable, but the cover ensures that your family is not financially deprived-of due to your absence. The insurance cover once taken has to be reviewed periodically. As your income increases, cover also has to increase. We suggest to review this cover every 5 years. Add-on insurance cover can be taken to maintain 12-15 multiple on enhanced income.